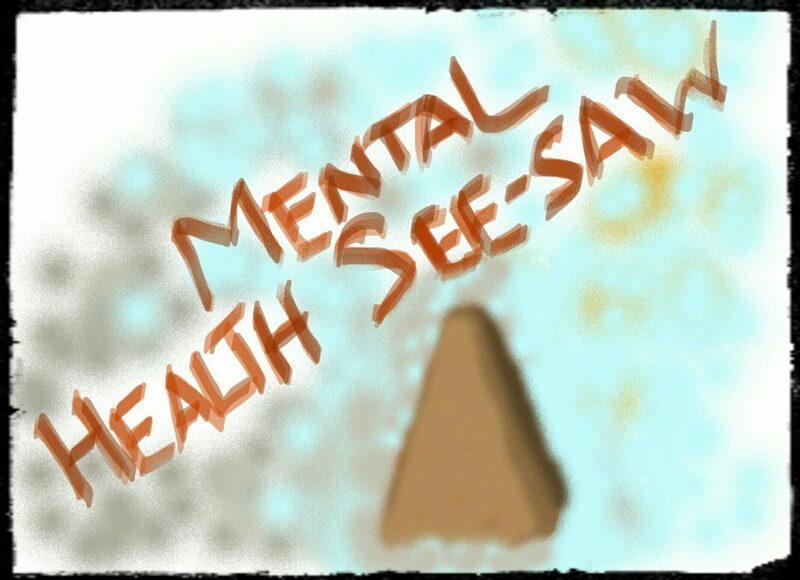 Playing on the mental health see-saw is not playing as you would a video game or any sport. It is like playing hide and seeks independently. You are trying to find the root cause of the lack of self- esteem, lack of confidence and allowing others to walk all over you; despite your knowledge of this happening to you, just to feel worthwhile. Hide and seek can be easy but it can be frustrating. Depending on whom you are and what you are up against. Some thoughts are easy to find, easy to understand and clear, whilst others are not. The reason for the see-saw is that it may not just be one thought that tips the see-saw. You may have to conquer several thoughts and experiences to get the see- saw to “balance”. Otherwise like most mental health sufferers you find the see-saw tipping one way on one day and the next day tipping the other way. It’s difficult to find that balance hence why the “Balance” is deemed a “perfect” scenario. Balancing this see-saw is a tricky and sensitive issue. A lot of short term solutions are available. They are attractive to a lot of people. A short term solution is just another way of hiding the issue. The Negative Side – These are the triggers of depression. Depression can stem for many reasons. For example, loss, failure and grief are commonly associated with depression. However other subtler causes exist like “Seasonal Affective Disorder” which is where the change in seasons can be difficult to adjust too e.g. in winter the change to long nights and cold temperatures can be difficult. Spending too much time on social networking sites can cause depression due to the isolation from actual live social interaction and therefore creating a barrier to being able to communicate with people generally. Genetic problems like Thyroid issues can also be a cause of depression which is hard to manage. Whatever the reason, depression exists and can stem from a variety of events. Anything from the ending of a relationship to the ending of a film (because the film may display a world we crave. To then know it doesn’t exist is hard to take). These are the things which make the see-saw tip down on the negative side. The weight of all those thoughts, outweigh the positive side leaving the weight on the negative side, ultimately triggering depression. A typical reaction therefore is to try to put a counter weight on the see- saw. Put something on the opposite side to push those depressive thoughts away. I look at these as the things that make you feel good. Make you ignore the negative side and hide the symptoms of depression for a period of time. Depending on what you do, determines how long the positive side has effect until you feel the symptoms once more. They help you forget the trigger; forget what you are feeling. This is not always good for you in the long run. The positive side resembles your state of mind and how the activity/ person/ item makes you feel. This could be drugs, a relationship for the sake of having one, spending money or drinking alcohol. These actions hide your negative side and anything short term or deemed a distraction may make you feel positive but will not help you in the long run. You may think that just doing these things will help remove the negative thoughts. But it is not that simple, as most of the time the “Positive” side is simply made up of “distractions”. “Distractions” temporarily weigh the see-saw down by merely reducing the weight on the negative side. It could be with medication, alcohol, holidays, food etc. None of these are everlasting and eventually the weight on the negative side grows again. However not all elements on the positive side are negative. Things like education for example or work to focus on are good ways of “taking your mind off things” but at the end of the day they are a “distraction” and won’t last forever for everyone. “Distractions” are not focusing on the causes therefore the work you are doing is not a long term solution. Only one side can be worked on at a time. Life Goals can be a distraction or they can be a long term help, depending on the life goal. What needs to be done is, in principle simple but in practice is a long journey. Find a long term solution. A weight on the positive side that is everlasting. Or in another sense, take some of the weight off the negative side by putting the weight on the positive side so that even though the triggers are still there, you are able to manage them. The one thing I had discovered from initially trying to put weight on the positive side was that there are two sides to the positive side. Not one like the negative side. The positive side has two planks – one that makes you effectively worse (Negative-Positive) overall as I found when hiding the bumps and one which will help which is looking at more long term solutions to weigh the negative side of the see-saw down (Positive- Positive). The Positive-Positive side is harder to reach and harder to push down which is why the Negative Positive side is so attractive and easy to manipulate but doesn’t lift much from the Negative Side which is why its effects are short term. The short term solutions are effectively the things that make you feel good for a short period of time and act as a cloud to the negative side. This side is easier to weigh down but the effects wear off quicker. Working on the long term issues will help weigh the more difficult issues away and give a more long term balance.